Beginning with the 2015 live-action Cinderella, Disney has started releasing remakes of its oldies-but-goodies. With Pete’s Dragon, Disney departed from the technique they’ve employed so far of adapting animated movies as live action and instead simply replaced the animated dragon in the mostly live action movie with a computer generated creation. Pete’s Dragon was an interesting choice for a remake since it lacks the “classic” status Cinderella and The Jungle Book enjoy. That said, the movie did garner some attention in its day, particularly for its score, and Disney has adapted the plot to incorporate a timely message about caring for the earth and all its living creatures. Pete’s Dragon (in both versions) follows the story of a boy named Pete and his protective, misunderstood, invisible, flying, fire-breathing dragon-friend, Elliot. Aside from that basic backbone, every other aspect of the film was changed (and, in my opinion, improved). Instead of a musical set in a turn-of-the-century, backwater fishing town, the new version follows the story of nuanced characters in a logging town dealing with an extraordinary situation. With strong acting and surprisingly seamless incorporation of the computer-generated Elliot, the new Pete’s Dragon is a decent film. I can’t say it was groundbreaking in any way, or even that I would go out of my way to see it again, but it was a sweet experience. I would recommend it for families with young kids or for devoted Disney fans, especially those who remember the release of the original. The aspect I found most fascinating was that the creators chose to set the film in the same era the original film was released – that is, the late 70s to early 80s. The nostalgic setting made the movie more appealing even for me – I imagine it would impact fans who grew up in that era even more so. Being able to see a Disney film at our local theater is always a treat, so I’m grateful for the film’s release and for the reminder that caring for the environment is another great way to keep the spirit of Disney alive at home. 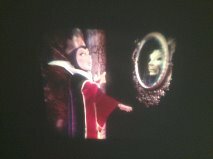 The majority of Disney movies are based on classic tales. 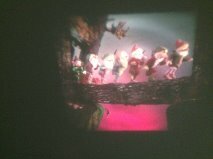 These sanitized, Disney-fied animations have become the ultimate version of many fairy tale stories and, as such, have drawn criticism for erasing the originals from the minds of generations of children. 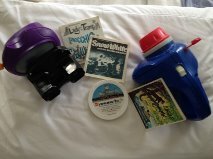 But I feel they cultivate interest in stories which children would otherwise never have access to. Yes, the Disney stories are vastly different than the tales they are based on – to be fair, many of the stories as we know them today had already evolved through oral tradition. 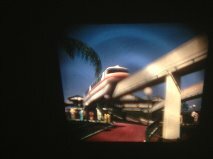 Disney, the most modern incarnation, brings its own contributions to the table – innovative art and animation techniques, moving music, and unequivocally happy endings. That’s not to say the old stories should be ignored or their darker components completely forgotten. Both versions serve their purpose, and an interesting way to experience these stories is to see them from both perspectives – so I have embarked on a literary journey. I will read the original stories on which the Disney movies were based. I’ve started with the Tarzan books. That’s right – books, plural. The story of Tarzan was not the subject of one novel. In fact, Edgar Rice Burroughs wrote 24 Tarzan books in total. In the interest of time, I decided to stick to the first two novels, Tarzan of the Apes and The Return of Tarzan, which, as far as I can tell, form a complete story arc from which Tarzan’s other adventures stem. While Borough’s prose is not exactly artful, he effectively weaves a compelling adventure story that must have been especially dazzling to his early 20th century readers. A modern audience cannot ignore the glaring scientific inaccuracies or racist and sexist commentary. However, the observations Burroughs makes through the lens of a man who grew up outside of society and is more perplexed by the behavior of the “civilized white man” than what those men would call “savages” is somewhat progressive for his time in that it rejects the concept of colonization as an inherent good. 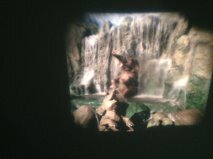 With the time period in mind it’s perfectly possible to delight in Tarzan’s many adventures. Interestingly enough, in the original story, it is Tarzan who teaches himself to read and write using the books his dead parents left behind. He educates himself to some extent about the human world long before Jane and Professor Porter ever set foot on the island. The novel spends much more time on Tarzan’s early life, starting when his parents were marooned before his birth and focusing on his path to respect among his primate family. When he does meet Jane, the complications of a sophisticated American (unlike in the Disney film) woman having a relationship with an orphaned jungle wild man whose origins are a mystery are not glossed over. A love triangle does develop between Tarzan, Jane, and Clayton – who, although an obstacle to Tarzan’s desires, is not in fact a villain – and the unusual circumstances of Tarzan’s very existence complicate this. The second novel, which details Tarzan’s adventures in the “civilized” world after Jane’s reluctant rejection, covers an even wider range of topics. Our hero duels a jealous husband, has multiple run ins with a pair of Russian spies, goes undercover in the Middle East for the French government, is captured by and rescued from a nomadic Arabian people, joins an African tribe, and infiltrates a golden city run by vicious human-ape hybrids – multiple times. Not to mention several nearly romantic encounters with beautiful women and quite a lot of unarmed lion killing. Meanwhile, Jane’s story is not forgotten and intertwines in complicated, unexpected ways with Tarzan’s adventures. As with most of their films, Disney took the basic premise of the Tarzan stories and ran with it, simplifying the plot to fit neatly into 88 minutes and an inspiring message of self-discovery. A soundtrack was added, sidekicks developed, and a couple of nasty raw-flesh eating scenes removed. Although these changes fundamentally altered the nature of the story, without them the movie never would have appealed to a modern audience and I never would have thought to explore an early 20th century adventure series that turned out to be surprisingly rewarding. The Good Dinosaur coming to a theatre near you. You know what’s fun in between visits to Walt Disney World? Going to see Disney movies. When possible, we like to go on opening night or sometimes on secret early screenings just before opening night. For the last several years, we’ve been going with friends to the secret early openings for the summer Pixar film. These openings usually occur around the last day of school so it’s a fun way to kick of summer vacation. This year with Inside Out, we were able to see a special behind the scenes tour of Pixar Studios and a live interview with Amy Poehler at the end of the film. They also gave away a poster and lanyard. Here are release dates for the next year or so. Good news: the dates are set for all 3 new Star Wars films and for the highly anticipated Toy Story 4. Upcoming Disney Movie release dates. These could change and we’ll try to update them. Walt Disney released his animated film Peter Pan in 1953. Already a beloved story with a variety of adaptations in print, on stage, and even on film, Disney’s take on this relatively young classic quickly earned a prominent place in the canon of Peter Pan lore. 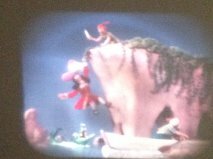 Two years later, the movie was the inspiration for the Peter Pan’s Flight ride at Disneyland which was one of the few attractions that were operational on opening day. 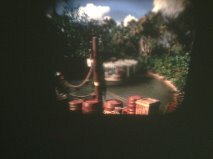 Sixty plus years later, the Disney film and theme park attraction remain as popular as ever. 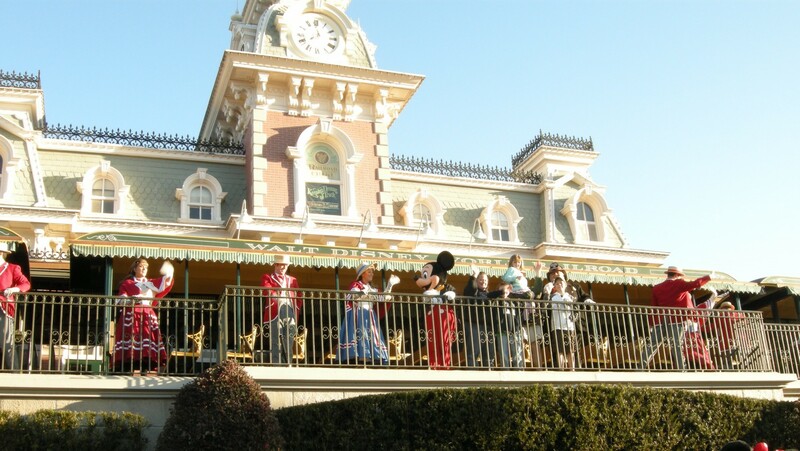 We all know that on any given day, people will wait close to two hours in Fantasyland to take a ship ride in the midnight sky from London to Neverland. There are new stories about Peter Pan being written. New movies and plays as well as revivals of old favorites are being produced. There is a bus company that bears the name Peter Pan as well as a popular brand of peanut butter who’s marketing campaign equates our “belief” in peanut butter with the “belief” in Peter Pan. We are culturally awash in Peter Pan, but how many of us have actually read it? If you haven’t, put it on your list of family books to read. 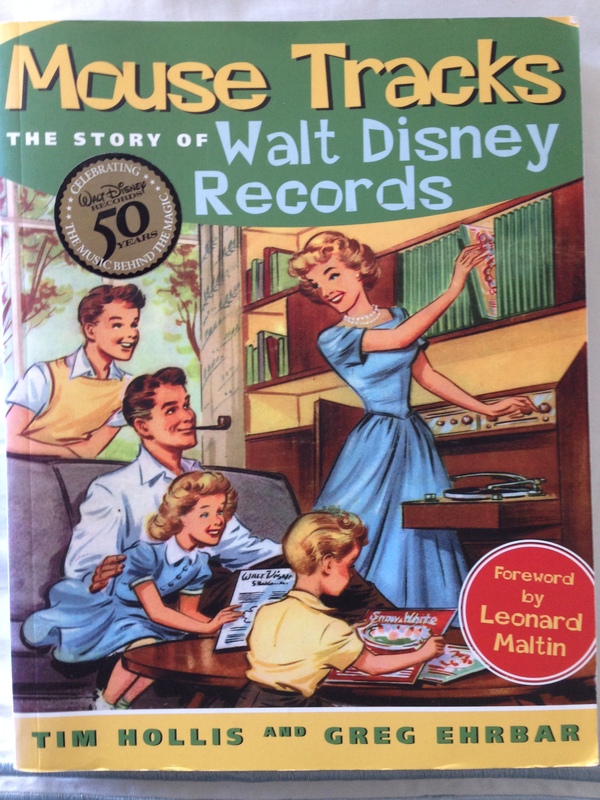 I’m not suggesting you read any of the editions adapted from the Disney film although that can be fun too. Rather, I am suggesting that you read J.M. Barrie’s original, unabridged story. If you don’t already own a copy, your local library will have one or you can purchase one on a kindle device for less than five dollars. 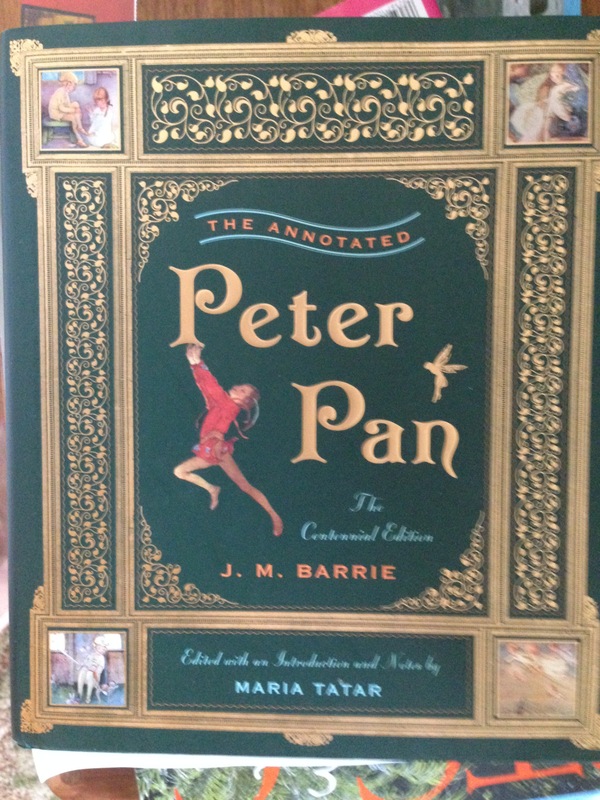 Of particular interest to me is The Annotated Peter Pan – The Centennial Edition edited with an introduction and notes by Maria Tatar and published by W. W. Norton and Company. Any good annotated edition will have an abundance of notes which define antiquated terms, explain customs and allusions that would be unknown to us today, and discuss themes, style, and imagery. This edition also has biographical information, a detailed history of the literary development of Peter Pan and beautiful illustrations from varied sources including all the pen and ink drawings rendered by F. D. Bedford for the original 1911 publication. It retails for about $40, but I found three copies on sale at an independent bookstore for $10. I purchased all three , gave one to my son, and gifted the others to friends who love Peter Pan. You can probably find copies online for less than retail, but had I paid $39.95 for it, I would not have felt ill-used. At the time of publication in 2011, editor Maria Tatar was teaching courses on literature and folklore at Harvard University where she had served as dean for the humanities. In addition to the text and illustrations, Tatar meticulously chronicles Barrie’s development of Peter Pan from secondary character in a novel to lead player in his own story. She notes that the character Peter Pan debuted in Barrie’s novel of 1902 The Little White Bird. In this novel, Peter Pan is a seven day old boy who has a number of adventures in Kensington Gardens. Those adventures were subsequently published separately in 1906 under the title Peter Pan in Kensington Gardens. After reading The Centennial Edition. . ., I had a little adventure of my own, which brought me very close, literally, to J. M. Barrie’s masterpiece. There is another part of the Peter Pan legacy that resides at Yale. Before Barrie wrote any of the Peter Pan stories, he published a scrapbook of sorts chronicling the adventures he had one summer with Arthur Llewelyn Davies and his three sons. In 1901, the Davies family was vacationing close to where Barrie and his wife were also on holiday. Barrie was taking a break after toiling on a play called Quality Street, which was being produced in America by the great (if not infamous) theatre owner and producer Charles Frohman. 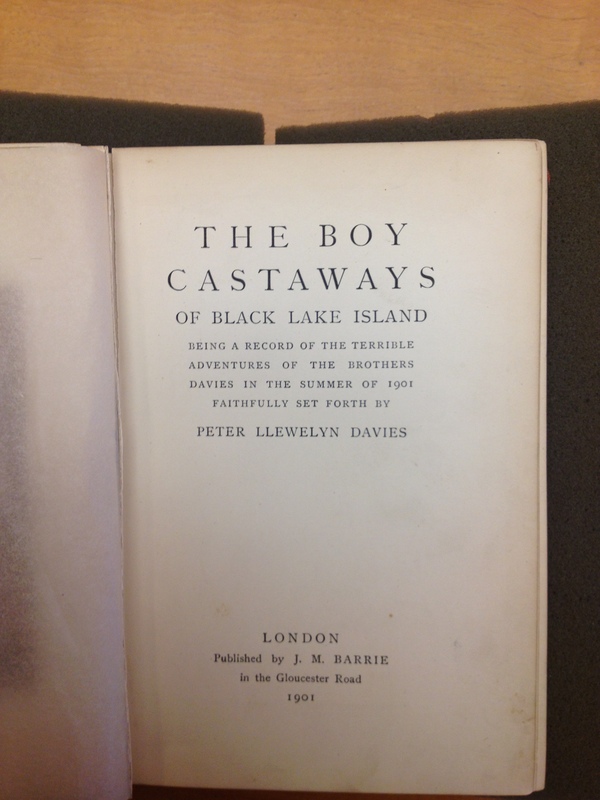 The full title of this book is The Boy Castaways of Black Lake Island, being a record of the terrible adventures of the brothers Davies in the Summer of 1901, faithfully set forth by Peter Llewelyn Davies. One copy was given to Arthur Llewelyn Davies. He claims to have lost it on a train. 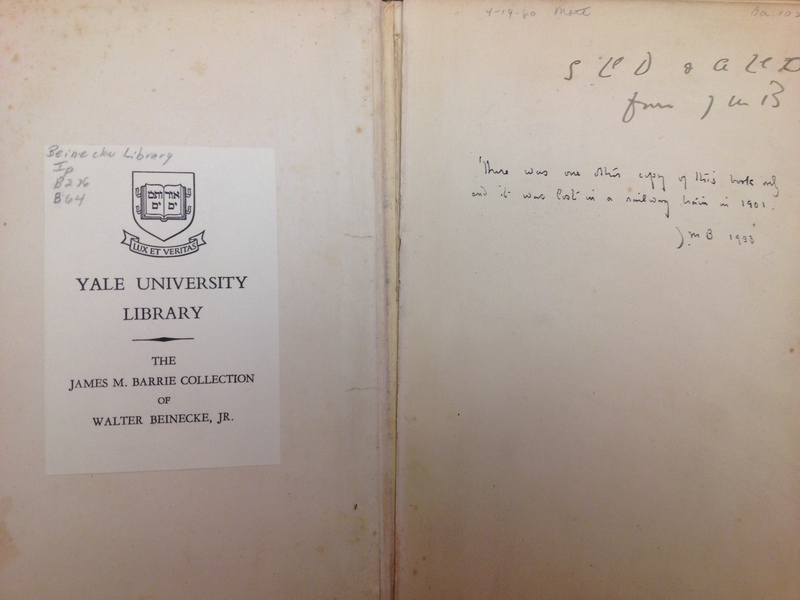 The sole remaining copy resides in Yale’s Beinecke Rare Book and Manuscript Library. I live in Connecticut, not terribly far from New Haven. 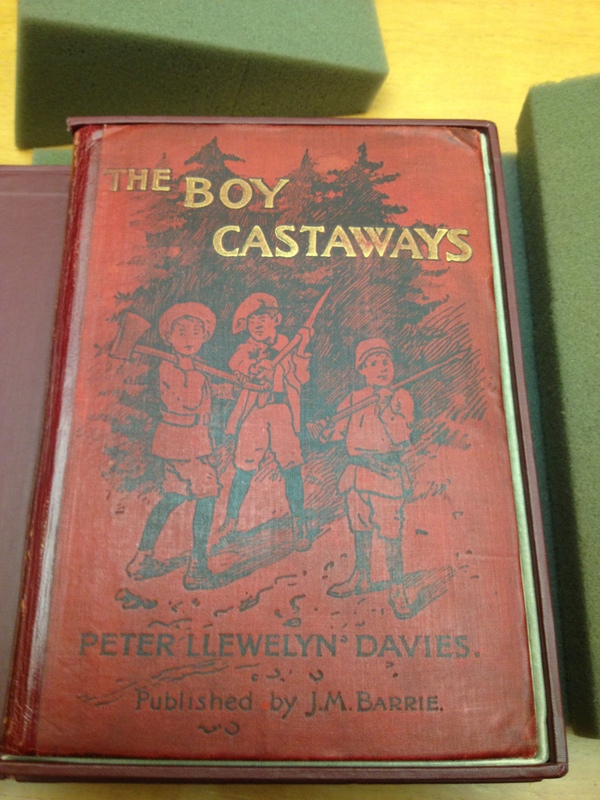 About a year ago, I found myself in New Haven with a couple of hours to kill so I visited the Beinecke and asked if I could see The Boy Castaways of Black Lake Island. Anyone can view materials at the Beinecke. You need to have two forms of photo identification and you must leave coats, bags, folders, writing instruments and any object that might plausibly be used for theft or destruction, in a locker. Had I planned my visit, I could have registered online, but the librarians helped me do that onsite. Within ten minutes of my request, they brought me The Boy Castaways. . . . The book is stored in an archival quality box. I was given the box, the book and three pieces of foam on which to rest the book. I was then invited to enter the Reading Room where I spent a half hour with this literary treasure. The cover was a handsome deep maroon color. One of the front papers had a note signed by J. M. Barrie himself: “There was one other copy of this book only and it was lost in a railway train in 1901. J M B 1933.” The photos were in excellent condition and conveyed the sense of whimsical adventure of the Davies brothers that summer. It was terribly exciting for me to hold and peruse this extraordinary relic from the world of Peter Pan. It seemed so new even though it was fashioned five years before my grandmother was born. For a few brief minutes, I felt like I was part of the legacy of Peter Pan. 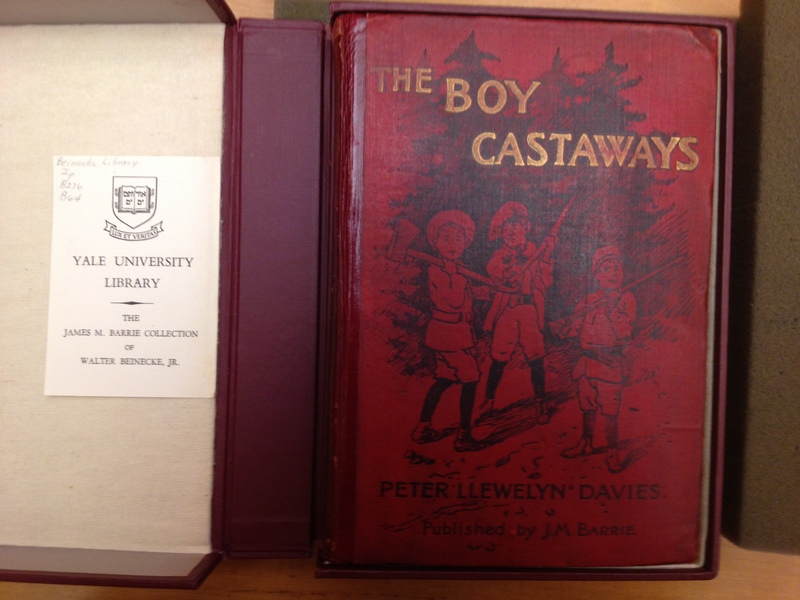 If you might be inclined to examine The Boy Castaways. . 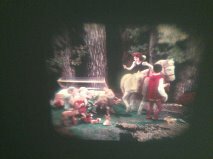 ., assorted ephemera related to Peter Pan or any of J. M. Barrie’s papers, the Beinecke Library will welcome you. I should warn you though, that the Beinecke Library is closed for renovations until fall 2016. Meanwhile, before you leave for your next trip to the Walt Disney World Resort, go read Peter Pan. 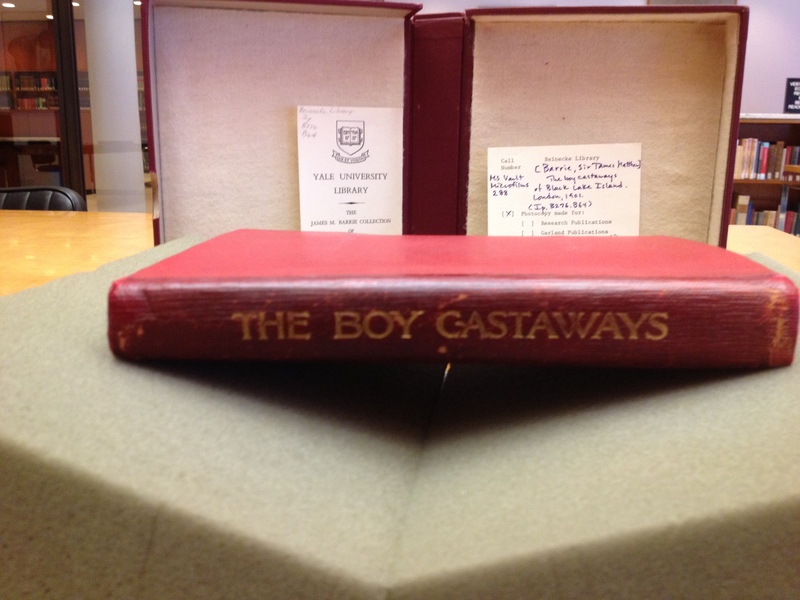 The Boy Castaways. . .